Article written by Molly Ford, Curatorial Intern. Daniel Dickinson (1795-c.1866) was born on October 20th in 1795 in Milton, Connecticut, to Anna Landon and Oliver Dickinson, Jr. He was the younger brother of well-known portrait miniature painter Anson Dickinson. His father Oliver was also an amateur portrait painter. Daniel Dickinson grew up with his siblings Anson (1779-1852), Raphael (1781-1837), Ambrose (1783-1806), Lucinda (1785-? ), Leonard (1788-1824), Henry (1790-? ), Anna (1792-1792), Anna Landon (1798-?) and Andrew (1801-1883), and his parents in Milton, a village located on the banks of the Shepaug River in the township of Litchfield. In Milton, he was apprenticed to become a silversmith like Anson, but also like Anson, Daniel abandoned the craft to paint portrait miniatures. 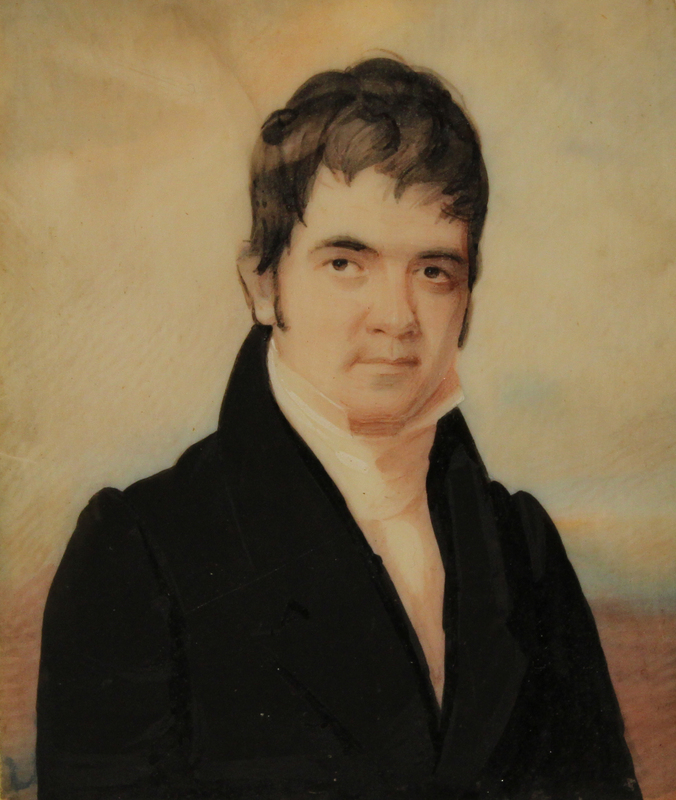 Portrait miniature of unidentified gentleman, attributed to Daniel Dickinson. Recently acquired by the Litchfield Historical Society. Daniel is believed to have studied in New Haven, Connecticut in about 1812. There, he studied draftsmanship from drawings and books with the brothers Nathaniel (1796-1881) and Simeon Smith Jocelyn (1746-1823). While there, Daniel was almost unconsciously drawn into miniature portrait painting, and in his experimental years at school he created fancy sketches that were very attractive and popular. These sketches mostly consisted of female figures in graceful positions. Daniel Dickinson wrote himself that “I have employed my leisure time in fancy subjects, such as might best illustrate female beauty and grace”. Because his work was so popular in New Haven and showed much potential, after his schooling he moved to Philadelphia to paint portraits and miniatures, which he did from 1818 to 1846. 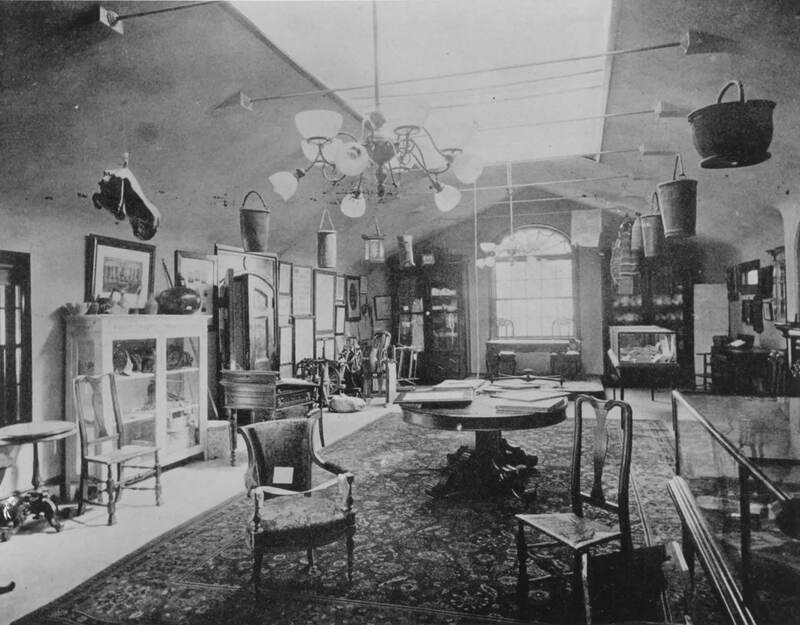 He was exhibited annually at the Pennsylvania Academy of the Fine Arts and regularly at the Artists’ Fund Society, as he was a member himself. He became very successful and well-patronized in Philadelphia, so he remained there for a great number of years. On his painting style, Dickinson wrote, “I adopted a style between my brother Anson’s, Malbone’s and J. Wood’s, fifteen years after my brother commenced”. This style included a feigned landscape background, and a more fashionable rectangular format. Daniel’s miniatures are often mistaken for his brother’s work; however, Daniel’s style differs in that he worked with a broader and more painterly brushstroke than Anson, which left the effect of a freer, less controlled presentation of hair and clothing. Also, his faces were strongly modeled, with deep contrasts between light and dark areas. His main method of creating portrait miniatures was watercolor on ivory. Daniel also advanced to painting on some larger canvases and oil portraits around 1830. An example of Daniel Dickinson’s trade label, found inside the case of a recently auctioned portrait miniature. In 1847, Daniel moved to nearby Camden, New Jersey, and as the years went by and his success dwindled due to the rapid development of photography. Soon after, he abandoned his career as a portrait painter and devoted himself to horticulture. In Camden, he opened a rose and grape nursery in 1850. Daniel Dickinson died in 1866 in Litchfield, Connecticut. This entry was posted in Artifacts and Archives on July 8, 2016 by Alex Dubois.